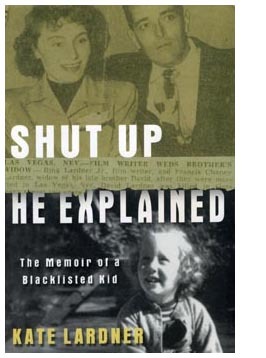 Kate Lardner is the author of Shut Up He Explained: The Memoir of a Blacklisted Kid (Ballantine Books, 2004). Ms. Lardner's essays and articles have appeared in various publications, including the New York Times, Good Housekeeping and Town & Country. She has taught writing at schools and institutions, including the C.G. 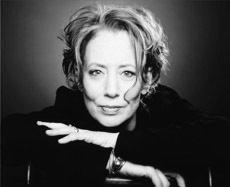 Jung Institute of New York, Manhattanville College and The Writer's Voice, and currently she teaches privately. Ms. Lardner has appeared on radio and TV talk shows and panels, and, as an actress, on film, stage and TV. She studied acting with Sanford Meisner (in N.Y.) and Peggy Feury (in L.A.). Her new book in progress, The Conference Call, is a creative-nonfiction memoir. To find out more about private sessions with Ms. Lardner and/or her writing workshops, please contact her. Shortly after they were married, Ring was called to testify before the House Un-American Activities Committee. Asked about his membership in Hollywood's Communist Party, Lardner said: "I could answer...but if I did, I would hate myself in the morning." This much-publicized declaration of silence sent Lardner to prison. Subsequently neither he nor Frances could get work, which marked the beginning of Kate's blacklist childhood. Kate Lardner presents a vivid, behind-the-scenes look at weathering this ruthless and absurd period in history. "Lardner descends from several generations of literary forebears and has inherited their talent by nature or nurture or both. Her book provides an unusual, child's-eye view on Hollywood in the McCarthy years and after. There's a quirky logic to the collage of excerpted letters and diary entries; Lardner interviewed many of the players for the book, but nothing's forced. This is Lardner's first book, but hopefully not her last." "Wrenchingly funny, the memoir is full of letters and diary entries and cameos by Zero Mostel and Dalton Trumbo. ...[I]t's a poignant portrait of a dark time." "Much has been written about the McCarthy era, about the blacklist years, about the Hollywood ten. But this memoir, from the viewpoint of the child whose life is turned upside down for reasons she cannot hope to understand, would be unique even if it were not also filled with anecdotes about one of America's more interesting families." "Lardner, granddaughter of the short-story master Ring Lardner, corners the market on irony in a political and literary memoir about growing up in the 50s under the shadow of the Hollywood blacklist...An engaging family history laced with bittersweet humor." "In this sad, yet achingly funny biography, Kate tells about her life growing up at a time of cruel injustice, describing the confusing upheavals of her childhood. She presents a sharp look at her personal life as the daughter of famous author Ring Lardner Jr. With humor and delicious wit, her story brings an absurd period of history to her readers telling it from her own experiences absorbed through the events that surrounded her. This is truly a worthwhile book, both enlightening and delightfully written." "This story of Cold War collateral damage is impossible to put down." "Kate Lardner has written a witty, scrappy memoir of the effect that the McCarthy years and the ominous blacklists had on her family." "More than most people, I know what it was like to grow up under the shadow of the Hollywood blacklist. There were bad times and good, all shared with a group of remarkable people. Not everybody gets to see Zero Mostel doing his imitation of a coffeepot in their kitchen. Katie's memoir brings back that time with humor, insight, a merciless gaze, and gentle tolerance. To my ear it rings as true as a bell." "It's impossible to read Shut Up He Explained without falling for its narrator. We have had blacklist memoirs by blacklist victims and victimizers, but here is a memoir by a child of the blacklist, written with love, confusion and vulnerability. Lucky for us, Kate Lardner seems to have inherited the Lardner writing gene." "Kate Lardner is funny, my favorite kind of funny. Dry, aching, sad, surprising funny. Her writing is delicious. During his time, McCarthy may have been able to silence great writers like Ring Lardner Jr., but he couldn't control the illuminating insights, originality, and irony of his daughter. Thank God! A wonderful memoir of a dark, disturbing time in America that could easily be right around the corner."